I had a stamping night last night! Mojo Monday is celebrating their 100th sketch by posting a different sketch each day! I took the stack upstairs last night and had fun trying a couple. First is the Mojo100 sketch. I used (for the first time!) the Circle Circus set. Card base is Elegant Eggplant. Whisper White is stamped with two different circle images, one in Crushed Curry, the other in Elegant Eggplant. The Crushed Curry scallop circle is from Textured Cardstock. 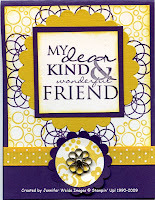 My dear, kind & wonderful friend from the All Holidays set in Elegant Eggplant, on Whisper White. Edges are sponged with Crushed Curry and layered onto Elegant Eggplant. Crushed Curry polka-dot grosgrain under a Scallop Circle punch Elegant Eggplant with another image layered on. A large Filigree brad in the center for the final accent. Love these colors together & how quickly these sketches turn into cards!! One more coming right up!